La Crosse, MN — Former Minnesota Vikings defensive tackle, Alan Page, was the keynote speaker at the La Crosse Community Martin Luther King Jr. celebration held on Monday, January 20, at Viterbo University Fine Arts center. His appearance was co-sponsored by the D.B. Reignhart Institute for Ethics in Leadership. Photo shows Minnesota Supreme Court Justice and former Vikings defensive tackle, Alan Page, speaking about his past achievements and current goals in 2013 with the Page Education Foundation. 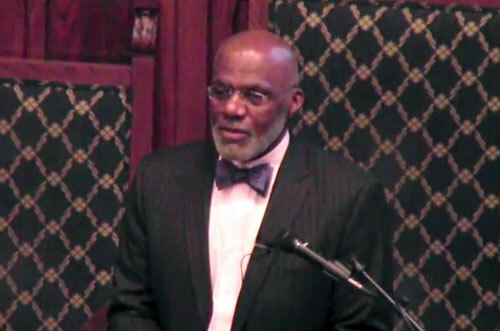 Watch the following video where current Minnesota Supreme Court Justice and former Vikings football player Alan Page stops by to talk about his past achievements and current goals with the Page Education Foundation. Page, 68, is currently an associate justice of the Minnesota Supreme Court and a member of both the College Football Hall of Fame and the Pro Football Hall of Fame. He graduated from Central Catholic High School in 1963 and received a B.A. in political science from the University of Notre Dame in 1967 and a J.D. from the University of Minnesota Law School in 1978. Minnesota requires judicial retirement at age 70, and Page intends to become a public school teacher after he leaves the bench. If you would like to book athletes like Alan Page for an event, contact Sports Speakers 360’s booking agent for appearance & speaker fees or call 1.855.303.5450. Alan Page has had an even more extraordinary career post-football and he was a great player. What an outstanding person he is!